In real life, I do discuss food exactly like how I write in my food review articles. As always my food reviews are scored only on what I've tried and the service expected of that type of establishment. In days gone by, this spot was where Melbourne Uni pizza lovers would hang out. This was the location of the footy themed Mark's Place pizza joint. The Victorian terrace exterior is the same, while the interior, I believe is mostly the same except with a more Chinese flavour. Colourful Yunnan takes its name from the Yunnan province of China. The menu is actually part menu part travel catalogue. Chinese for southern cloud, Yunnan province's picturesque photos is in itself a tourism campaign. You'll be forgiven for forgetting to order as you read through the menu. Usually the staff leave you alone if you tell them you're still browsing. I'm sure they are used to people becoming engrossed in reading the menu. Prior to reading their menu I wouldn't have realised there was so much more than rice noodles. Yunnan rice noodles are famous for being well great. Forget rice vermicelli (the super fine rice noodles). Forget spaghetti. Yunnan rice noodles (mixian) are similar in thickness to spaghetti and have a texture that just makes you want to slurp them down. For lack of better words, they are slippery smooth. There's a slickness that make Yunnan noodles one of my favourite noodles. In Hong Kong, there is a version where you can slurp them down with Cantonese barbecued pork and vegetables. As my love of Yunnan noodles distracts from trying more adventurous options on the menu, it's not hard to guess what I always order. For a more adventurous connoiseur the menu offers diverse dishes. Yunnan province is to the southwest of China and borders Burma, Loas and Vietnam. There are pages and pages of regional Yunnan dishes from noodles to rice dishes. They even included a type of hotpot that I've never heard of before. If you are looking for a simple stir-fry than try a Chinese diner instead. Colourful Yunnan is about Yunnan, as New Shanghai is about Shanghai. However I only know about Yunnan noodles, so let's get back to them. The beef rice noodles were meant to be the non-spicy option. I felt the spice, yet I couldn't resist the noodles. They were quite good even though I had to keep drinking my rose tea to stop my tingling tastebuds. There were some bean sprouts in the soup and these made a refreshing companion to the beef and noodles. The beef really fades into the background as its really the noodles that are important. Although it is a little spicy, I would order it again. The sweet but not overly sweet rose tea was a nice refreshment even by itself. Colourful Yunnan brings the flavours of Yunnan. The menu itself is engrossing and offers many regional varieties. If you don't know what to order then go for the Yunnan noodles. 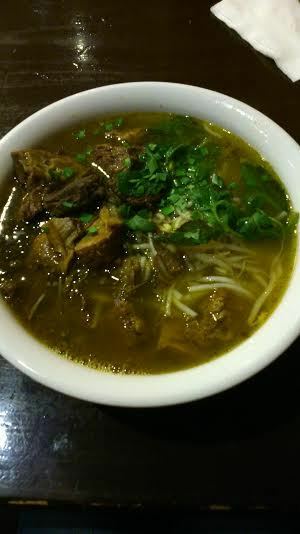 At the end of the day, Yunnan noodles is the most famous dish from Yunnan.